1. The Coffee tree first sports a white blossom followed by the coffee cherry, which starts green, turns yellow and then red - this is the stage for picking. 2. The coffee plant is an evergreen, which only grows commercially within the tropics. 3. Of some sixty species of coffee the types Arabica (high grown quality coffee) and Robusta (hardy, low-grade coffee) are the most extensively cultivated. 4. Coffee is second only to oil in importance and value in terms of world traded commodities. 5. For ease of picking the coffee plant is usually grown as a 5 to 6 foot shrub and starts to product fruit at three to four years. If left unpruned the trees can grow as high as 30 feet. 6. The coffee tree will bear fruit for approximately twenty-five years. 7. The coffee plant produces blossom, unripe and ripe cherries all at the same time, making hand picking the most practical form or harvesting. 8. A healthy tree can produce from between four to six pounds (2-3Kgs) of fruit per year, the green beans within the fruit weighing one to one and a half lbs (500-750g). 9. Depending on the darkness of the roast, between 12% and 25% of weight is lost in the roasting process. 10. 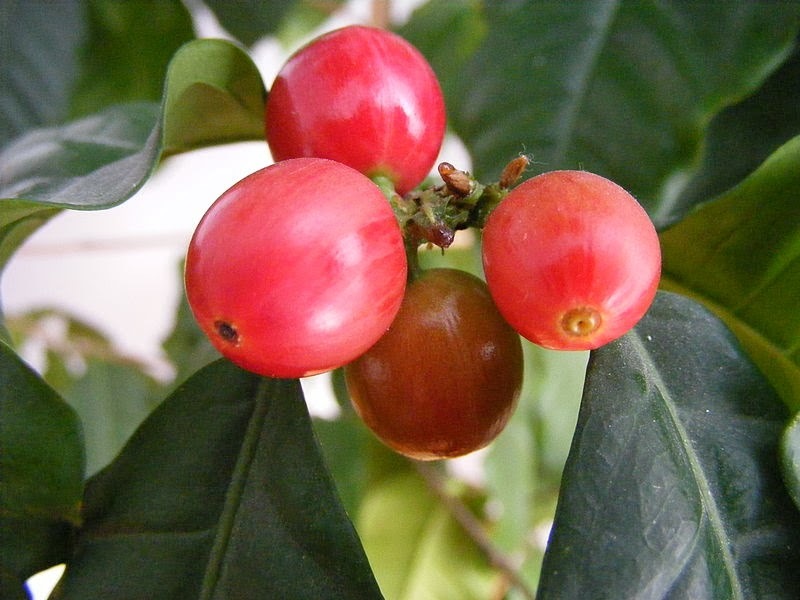 Coffee beans grow in two distinct halves within the cherry with their two flat faces towards each other. When one half does not grow the remaining bean forms into a rounded pea shape hence the name “Peaberry”. 11. The word coffee derives from the old Arabic/Turkish words gahwah, Kahwa and Kahveh which were originally the names for wine and excitement. 12. Coffee producing countries receive annually in excess of $10 US Billion for coffee sold on the world market. 13. An estimated 20 million people are employed in the coffee trade world-wide. 14. For third world countries such as Colombia and El Salvador in Central America and Uganda, Rwanda, Burundi and Ethiopia in Africa, coffee provides the main source of foreign exchange. 15. In the U.S.A alone in excess of 400 million cups of coffee are drunk daily. 16. 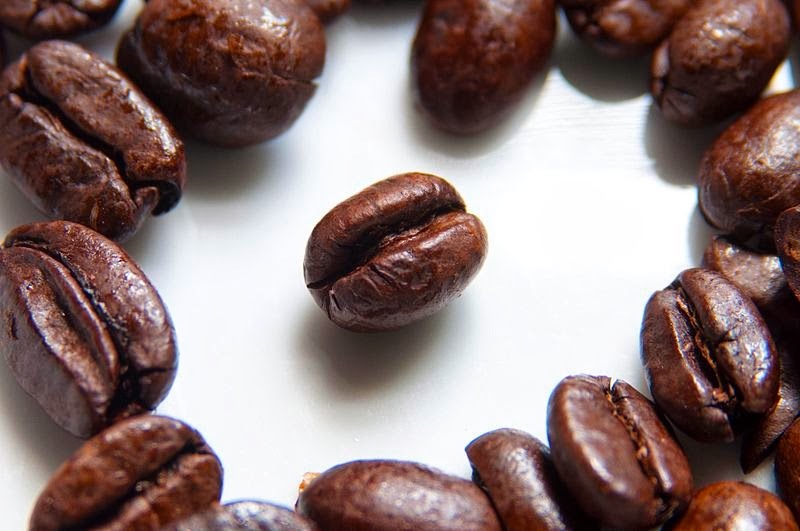 It is thought that originally coffee beans were chewed and that the leaves, the cherry husks or bark from the tree were used to make a brew before someone thought of roasting and grinding the coffee beans. 17. Legend suggests that a Yemeni goat herder by the name of Kaldi, was the first person to discover the positive effects of coffee when he observed the creatures in his charge becoming very lively after eating the leaves and berries on a coffee bush. Having boiled up a concoction of coffee beans he found he could stay awake all night and attend his herd. 18. Mocha coffee takes its name from the Yemeni port of Mocha, which was the main port from which coffee was shipped until the early nineteenth century when it was closed by a sandbar. 19. In sixteenth century Constantinople, the “crime” of drinking coffee was cudgelling for the first offence and if caught again, being sewn into a leather sack and thrown in the Bosphorus. 20. The Venetians first brought coffee to Europe at around the end of the sixteenth and the beginning of the seventeenth century. 21. The first coffee house in England was opened by a Lebanese by the name of Jacob at the Angel Inn, Oxford in 1650. A plaque opposite Queens College records the fact. 22. In 1733, J.S. Bach wrote the “Coffee Cantata” included are the words “Oh how true that coffee bliss is, sweeter than a thousand kisses”. 23. The largest insurance market in the world “Lloyds of London” originated in a 17th Century coffee house run by Edward Lloyd. 24. In the 17th and 18th centuries the patrons of London coffee houses would put money into a box marked T.I.P. which stood for “to insure promptness” hence the modern day word, tip, meaning a gratuity. 25. In the first half of the 18th century a Frenchman named De Clieu sailed with coffee seedlings to Martinique to establish the French coffee industry. On the voyage most of the seedlings died as fresh water became scarce and in order to save the last remaining seedling de Clieu shared with it his daily water ration. From this one seedling nearly twenty thousand trees existed within fifty years. 26. In order to control the production of coffee, the French would not allow any seeds or seedlings to leave their colonies where coffee was grown. However in around the 1720’s a Brazilian diplomat used his charms on the wife of the French Governor of Guiana who smuggled him some coffee seeds which is how coffee came to Brazil and where up to a third of the world’s coffee is now grown. 27. The Spanish roast coffee with sugar, which caramelises on the beans creating a dark, shiny appearance, such coffees are known as Torrefacto. 28. It is said that Voltaire, who drank copious quantities of coffee, when told by his physician that coffee was a slow poison replied that he knew it was a slow poison, it had been poisoning him for more than seventy years. 29. Excessive coffee drinking is sometimes said to be bad for health however Scandinavians who have the highest coffee consumption per capita in the world are also among those with the highest life expectancy. 30. In some parts of the world coffee trees are grown under the shade of other trees such as banana trees, not only do the coffee trees benefit from the shade, but the grower gets the additional advantage of a secondary crop. 31. In the U.S.A and most of Europe between eighty to ninety per cent of all coffees drunk are fresh ground, the balance being instant coffee, in the U.K nearly ninety per cent drunk is instant coffee. 32. Raw coffee beans are usually shipped in 60kg to 70kg hessian sacks although some coffees are now shipped loose in 22 tonne nett containers. 33. Arabica coffees grow at an altitude of 800 to 1900 metres, Robusta coffees can grow at sea level. 34. Arabica coffee trees are easily damaged by frost, too much sun, insects and drought but they need to grow on hillsides for adequate drainage, Robusta coffees are much hardier and need less husbandry. 35. The number of coffee trees grown per hectare can vary from 2000 to 100,000.